I was born December 25, 1927 in Hart, Michigan to Frank Bray and Sophie Retzior. I am the seventh of eleven children, six boys and five girls. I first met and was taught by the Grand Rapids Dominican Sisters in the Catholic elementary school in Weare, Michigan. This association led me to attend high school at Marywood Academy as an Aspirant and upon graduation, I entered the convent. After attending Aquinas College I began my teaching ministry in St. Joseph Parish in Saginaw. I spent 35 years teaching in grades K through 4. What means most to me is having been able to touch the minds and hearts of the very young. My years at Marywood have brought out the gift of being present to others and sharing joy and faith with the residents here at Aquinata. I know I am personally and deeply loved by God who fills me with great happiness and has given me energy to put my faith and love into practice. Each new day God has walked with me, even though at times I have wanted on my daily journey. I have been blessed by the people who have touched my life: family, community and friends. 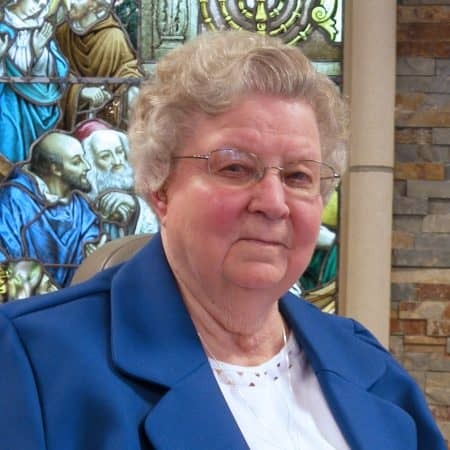 She has crafted thousands of Rosaries, praying over the beads as she works and sending the Rosaries off with the blessings of God and the Dominican Sisters. Sister Theresa Bray is a greeter in the reception area of Aquinata Hall. We are so blessed by her bright smile and warm presence.